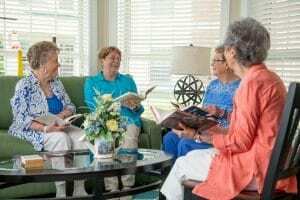 Barbara H., second from left, enjoys using the exceptionally lit, turret-style living area in her Red Bud home for relaxing and entertaining. Barbara C. and Barbra H. enjoy how being on the first floor allows them easy access to their homes’ attached patios and the ability to enjoy Woodlands’ picturesque campus. And when staying inside, they both love how spacious the Red Bud is. Barbra H. said, “The home really only has two rooms, but it seems like more than that!” She also likes how the living area can easily serve as both an office or as a well-lit place to entertain. Barbara C. shared how much she likes one of the unique features of the Red Bud: its octagonal, turret-style space with five large windows. “The turret area provides a lot of light and is a really nice sitting room where I’ve put a couch and some chairs,” she said. Barbara C. and Barbra H. have also added some personalized touches to their Red Bud residences, which has made them even more comfortable at Woodlands. Barbara C. decided to hire a decorator to create a customized furniture setup for her space, while Barbra H. had her home’s walk-in closet modified to offer more storage. Finally, both ladies are keen on the Red Bud’s kitchen. Although she doesn’t cook in it much because she enjoys dining in the dining room, Barbra H. remarked that her home’s kitchen is modern, convenient and beautiful. “It’s the nicest kitchen I’ve ever had!” she said. When they aren’t enjoying their time inside their Red Bud homes, Barbara C. and Barbra H. are reminded of why they chose Woodlands: the lifestyle. One of the reasons that Barbara C. chose Woodlands was its Life Care offering, which ensures access to any necessary healthcare right on campus. Her favorite part was getting everything she needed without having to leave her hometown. Barbara C. also enjoys the “carefree lifestyle” that Woodlands provides. She no longer worries about home maintenance, healthcare, security or property taxes, and she still enjoys the independence of driving her car and doing what she wants. “It’s like living at home, just in a different space,” she said. One of the things that has made Barbra H. feel even more at home is the friendly, positive atmosphere at Woodlands. “It’s been a real pleasure to meet new people and make new friends. I love how friendly people are here,” she exclaimed. Now that you know a little bit about Barbara C. and Barbra H., and why they enjoy living at Woodlands, we invite you to come learn more for yourself! 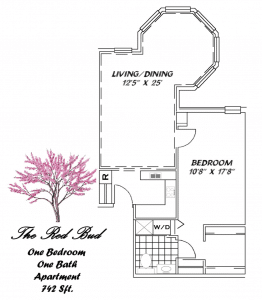 Visit and take a tour of the Red Bud residence, explore the campus and sample the social calendar. To schedule your visit, simply click here or call 304-697-1620!